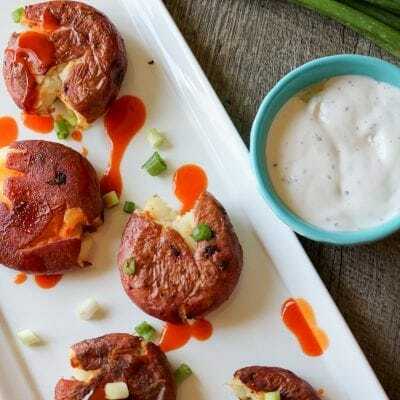 Buffalo Crispy Smashed Potatoes—Buffalo seasoning dresses up these smashed red potatoes. Served with a Ranch Greek Yogurt Dip for an irresistible treat. 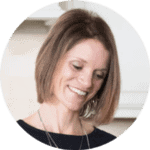 For more potato recipes, check out Instant Pot Crispy Potatoes, Twice Baked Potatoes, Baked Sweet Potato Fries, and Instant Pot Baked Potatoes. I will never forget the first time I hosted a Football Game Day Party. My husband and I just purchased our first house and I was eager to show it off to my friends. More importantly, I wanted an excuse to make all things delicious and stuff my face—because that is what football games are really about right?! Anyways, I remember I made Loaded Potato Skins, Cheesy Pizza Bread, Pigs in a Pretzel Blanket, and my Ultimate Taco Dip. It turns out there was a snow storm and my husband and I were left alone to nosh on the food ourselves. Secretly, I was happy. Funny thing is that looking back on that night, I still remember how good those potato skins tasted. Perfectly crisp on the outside and fluffy on the inside and the perfect vessel for bacon and cheese and a few chives for good measure. I mean really, who can resist a good potato recipe? And today as I sat and thought about Easy Game Day Recipes–I decided to up the traditional Potato Skin Recipe or Crash Hot Potato Recipe. 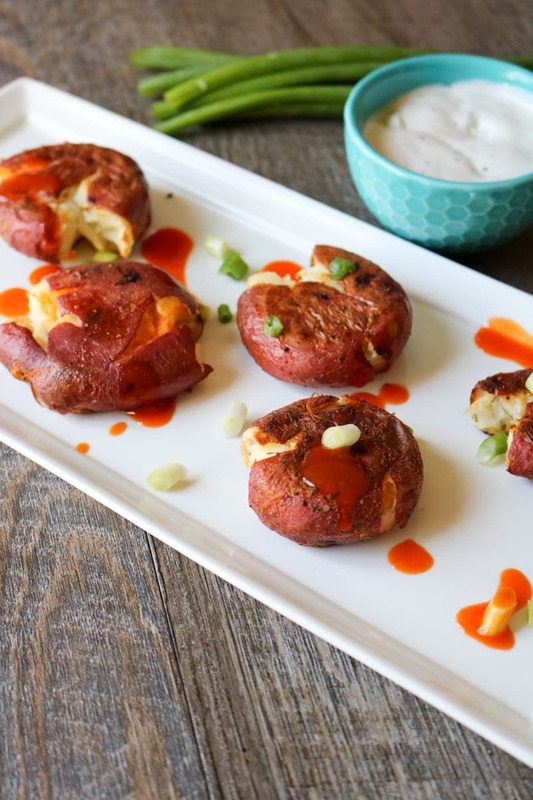 Tender, yet crispy, red potatoes are perfectly steamed then smashed and baked with Buffalo Sauce until they are crispy and browned. Then to cool off the heat, a thick ranch dip is served on the side for your dipping pleasure. 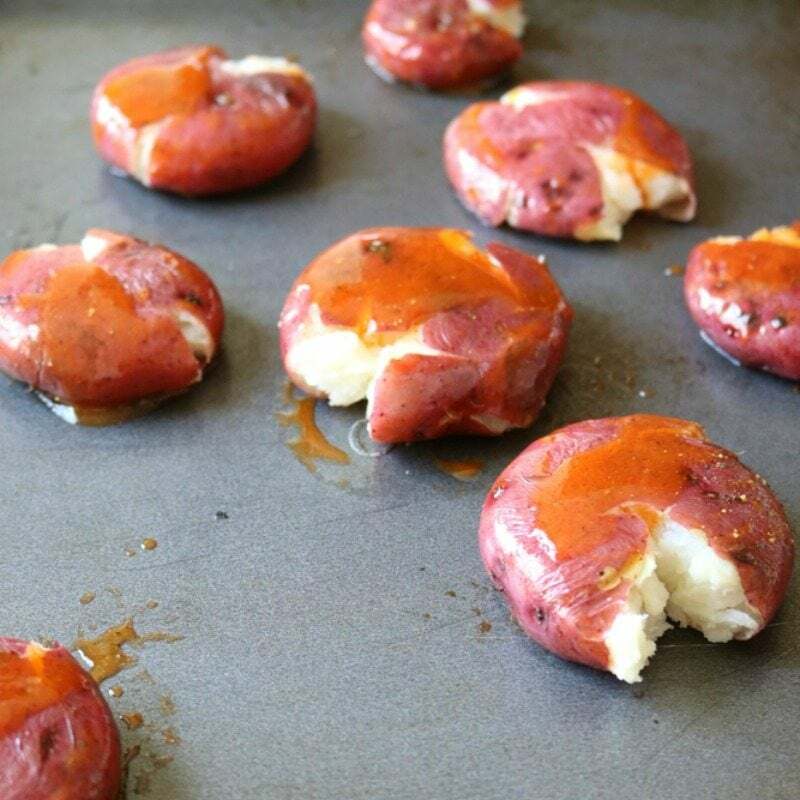 I am telling you that if you serve up these Buffalo Smashed Potatoes at your next Game Day Party, you will wish for a snow storm, so you can keep them all to yourself! They are IRRESISTIBLE. I started this recipe with a bag of Red Potatoes that were ready to be steamed in the microwave—almost TOO easy! Of course you can start by boiling the potatoes until fork tender as well. Then toss with some buffalo sauce and finish browning to perfection in the oven. 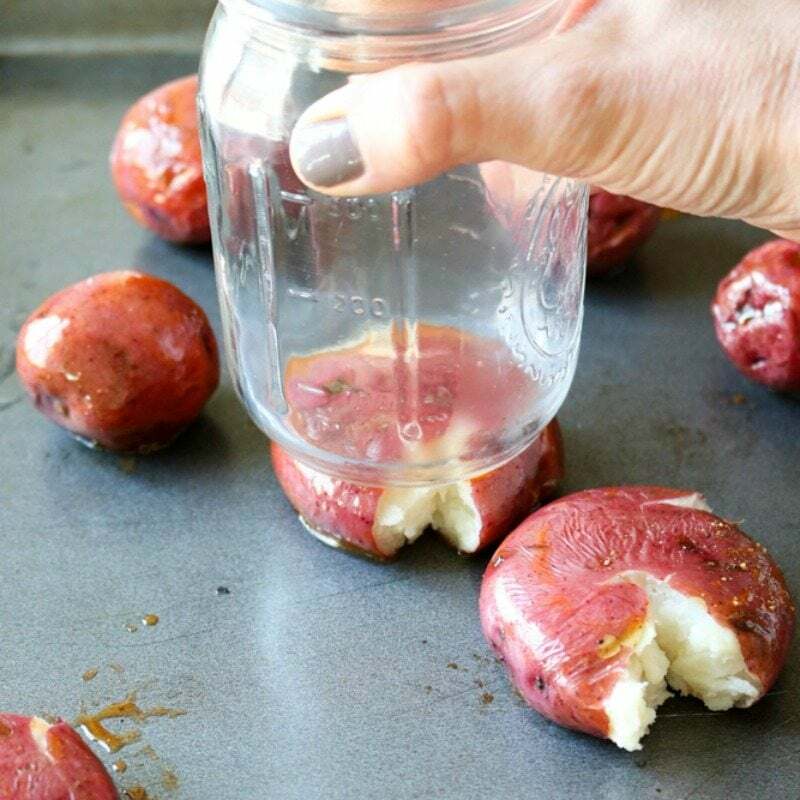 Once the potatoes are cooked through, you smash them down gently with the bottom of glass or jar. And roast until almost golden. After that, grab some napkins and some of my homemade Ranch Dip and dig in! The smaller the potato, the faster these crispy roasted potatoes will cook. You can use yukon gold, mini gold, baby fingerling potatoes, regular red potatoes for this Crispy Potato Recipe. I started out by using a bag of baby red potatoes that were able to be steamed in microwave, but if you can’t find those (or don’t want to pay the premium for that convenience), just boil the small potatoes until JUST barely fork tender. If you boil until fully fork tender, they will fall apart when you smash them. I used the bottom of a glass jar to lightly, but firmly smash my potatoes, a heavy pan or plate will also work. Or even another cookie sheet that will nestle into the baking sheet your cooked potatoes are on. If the buffalo seasoning is not your thing, toss with grated Parmesan Cheese and garlic powder. Best served with a homemade ranch dressing. 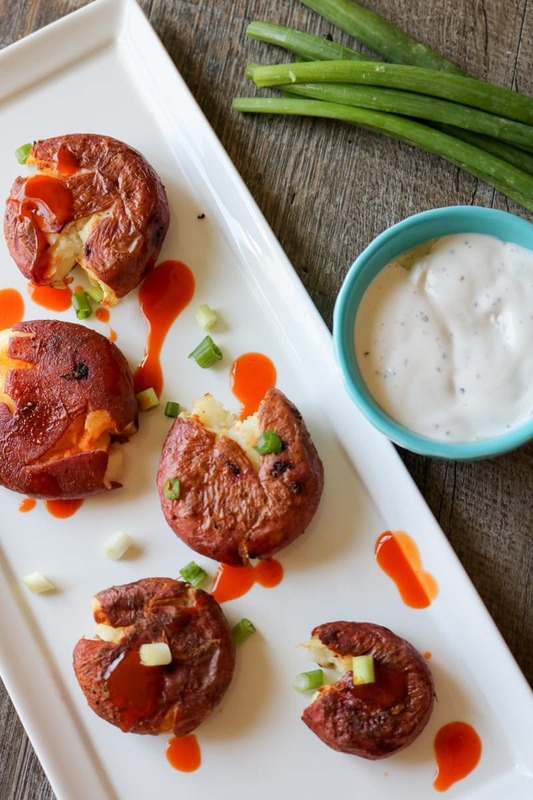 Buffalo seasoning dresses up these smashed red potatoes. Served with a Ranch Greek Yogurt Dip for an irresistible treat. Either steam red potatoes in bag according to package instructions or boil for 10-15 minutes, or until fork tender, but not falling apart. 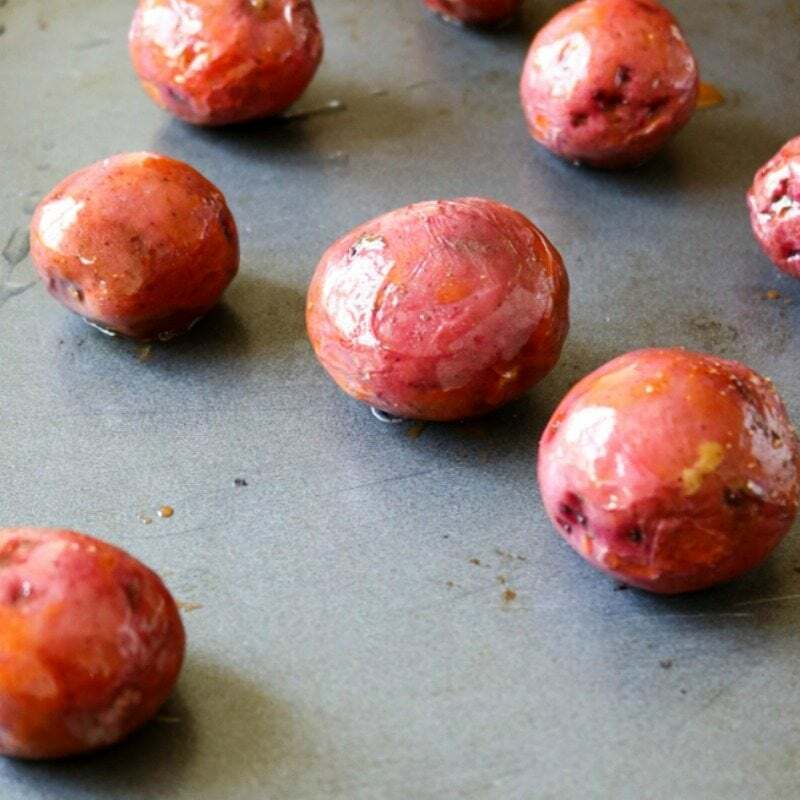 Toss cooked potatoes with oil, 1 tablespoon red hot sauce, and kosher salt. Place on cookie sheet, and using a glass or can, lightly push down on potato until it is smashed (but still in-tact). Roast for 20 minutes, flip, and drizzle remaning hot sauce over potatoes. Roast for additional 10-15 minutes, or until crispy and golden. Serve with homemade Ranch Dressing. I have to make these for my hubby….he loves all things buffalo (as do I)! 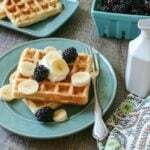 I bet you both will LOVE these Denise! I don’t think I would miss the wings if I had these instead. Nice being at the spud football buffet with you! We love smashed potatoes! Now I need to jazz them up with some hot sauce—so yummy!! I love everything buffalo, especially smashed taters! My mum used to sometimes make smashed potatoes with chili and salt then finished off on the grill. I can imagine this is a great way to enjoy them too. So much flavor in these bites. Thanks so much Cindy-they are filled with INREDIBLE flavor! 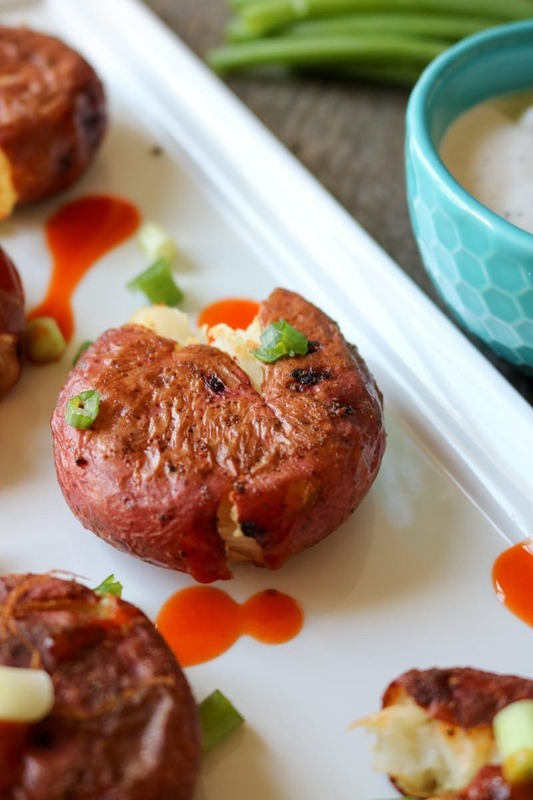 I absolutely love smashed potatoes and your version looks fantastic! 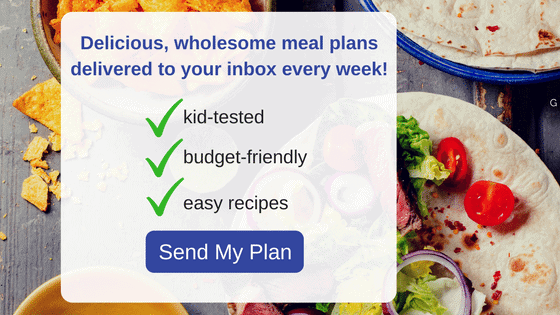 I think this might be my absolute favorite recipe of the week. So clever and easy, yet so full of flavor! Thanks for sharing!! Love the pictures!! Aw, thank you so much Marion! These look so flavorful and fun to eat! Yep, game day is ALL about the food! Those crispy edges are the best, especially when dipped in ranch dressing! I agree Sandra, those edges are what it is about! These were so easy to make! I loved how crispy the potatoes became and the buffalo spices made them so flavorful. I love this recipe for not only gameday but as an easy side dish. I am so glad you loved these potatoes Joanie. We can eat them ANY day of the week here too.